Dead or Alive will have your pulse racing throughout the game as you step into the precarious world of the Wild, Wild West. The scene for the game is set when you enter the Wild West where a mighty fierce storm is brewing on the western horizon, ready to strike thunder and lightning at any time. Saddle up, get a firm grip on your reigns and hold onto your hat cowboy (or cowgirl!) because you’re in for a wild, bumpy ride on this action-packed wild west themed slot game as you chase down the bandits that have held the town at ransom and win yourself some impressive UK online slots prizes. Remember to sign up and discover our fantastic range of promotions on EasySlots. 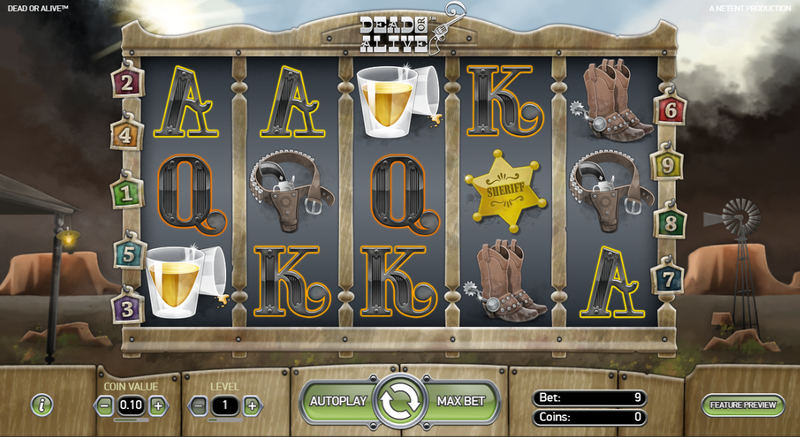 Dead or Alive is a 5 reel, 9 line video slot game that generously provides its players with some interesting money making features including Wild symbols, Sticky Wilds and Free Spins to lasso and reel in. The features not only help you reel in the cash, but they also add an extra element to the game, adding to the enjoyment of the gameplay and keeping things interesting while you play. Keep your beady eyes peeled for Wanted Posters of the villainous bandits, if you land one of these symbols on the reels it can be substituted for any other symbols apart from the Scatter which is a Pistol symbol. This Wild symbol will also give you a helping hand by dishing out prizes if you land more than three of these bad boys on any active payline. The trust Pistol symbol will see you right in this game, triggering free spins if you land three or more which will bag you a generous 12 free spins! 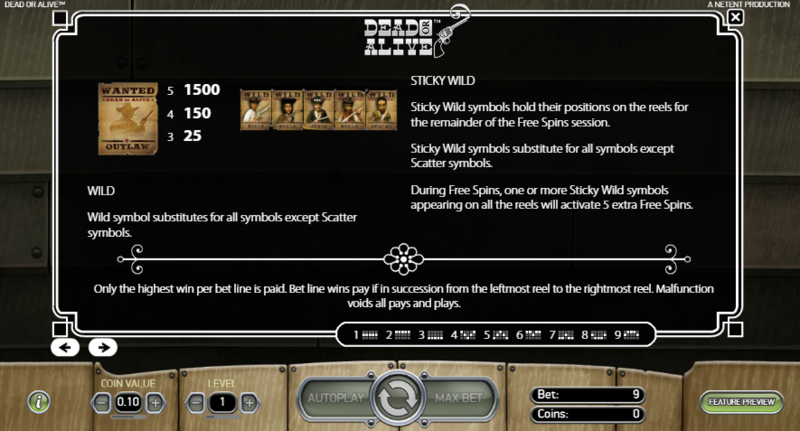 But that’s not all, be on the lookout for the Sticky Wilds on the reels which will appear during a Free Spin and will stay held into place on the reels once they land, right up until the end of the Free Spins round. If you are lucky enough to land more than one Sticky Wild you will trigger another five free spins! There’s plenty going on in this wild part of town, there isn’t a tumbleweed in sight, and this game has the potential to win you some great cash prizes if you’re brave enough to stand up to the bandits and give the reels a spin. The graphics and animations make for entertaining, light-hearted with themed symbols including a cowboy hat, sheriffs badge and jug of beer. The gameplay is smooth, whilst the features keep you on your toes so that the game isn't repetitive. The gameplay itself is simple to play, so it’s perfect for beginners. If you want more games like this, read more.